Well, the election mud is flying … but let’s get down to city business before diving into the unsavory stuff. The possibility of permanent lighting at Leo Mullen Sports Park filled the City Council chambers with lots of youth soccer players this week. Girls soccer players enjoyed competing on the new artificial turf at Leo Mullen Sports Park yesterday morning. In an impressive display of collaboration, the soccer club that wants the permanent lights and the Homeowner’s Association that represents some residents who don’t want the lights sat down and came up with a compromise proposal. This is the ideal situation for City Council Members attempting to balance competing community desires. Their proposal suggested that permanent lights stay on no later than 8:30 or 9 p.m. and be no higher than 30 feet tall. The city would plant and maintain a row of tall Cyprus trees on the south side of the soccer field to block light; and no lighting would be allowed on the baseball field, which is closer to the homes. The city was asked to make some traffic, parking, walking and safety improvements. There are 2,000 kids involved in the Encinitas Express soccer club and Leo Mullen is the city’s only dedicated soccer field. As the interest of our local community changes and evolve, we need public facilities to adapt too. When my mom was growing up in Encinitas, baseball diamonds were in high demand; now we hear repeatedly about the need for more soccer fields. As responsive civic leaders, the installation of artificial turf, and now, permanent, reasonable lighting at this designated sports park makes sense to me. • Under state law passed four years ago, businesses are required to recycle, not simply to put everything into the trash bin. In 2012, we had a 58 percent compliance rate by Encinitas businesses. After a newly initiated round of education and targeted outreach by city staff and EDCO, the compliance rate for businesses recycling has now risen to 92 percent. The goal is 100 percent by the end of the year. • Every trash can in the City of Encinitas needs to have a properly sized recycling container next to it. When trash is collected at the beach and parks, the two waste streams need to be kept separate and disposed of properly. In the past, this was not always the case. 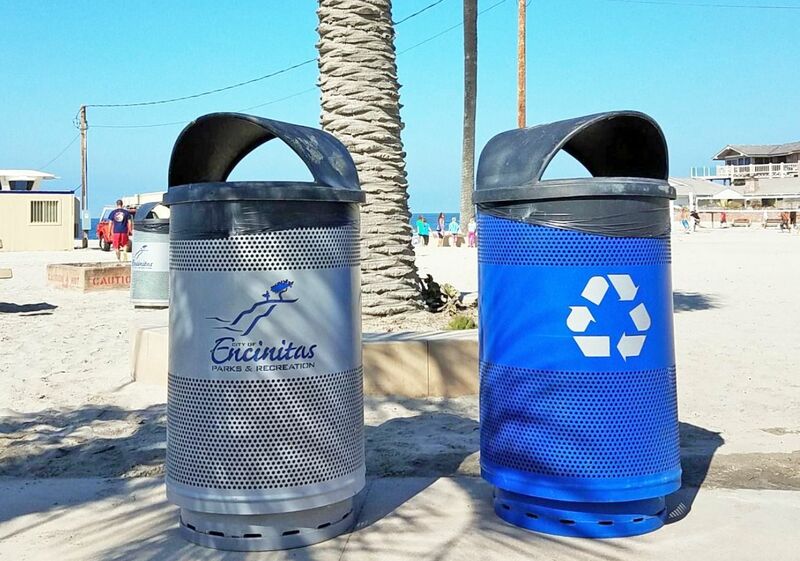 Further, all special events in the city, such as Taste of Encinitas or the holiday parade, need a recycling and waste management plan. EDCO, our waste hauler, provides recycling containers at no extra cost. I suggested the city consider a pilot program to collect information about what type of waste is being collected at events, and at a highly attended community event provide a grant for volunteers to be stationed at trash cans to designate waste/recycle/composting at the point of decision-making. The Solana Center performed this service for three years at the Switchfoot Bro/Am concert and 55% of the waste material generated was recycled. Due to a lack of funding this year, they didn’t provide the volunteers and only 18% was recycled. There’s clear evidence that guidance at point of decision-making makes a difference. It’s pretty easy to spot — the one with all the ads for my opponent and his friends, along with a couple of partisan editorials and token articles attempting to create an illusion of legitimacy. You’ll find a laughably slanted hit piece on its front page in which an accuser is quoted at length, but the only rebuttal included is literally two words excerpted from one of my newsletters. And from his ad, it appears my opponent, a doctor of physical therapy, continues to pose as a medical doctor in his campaign materials, despite repeated public criticism for perpetuating this falsehood. Shown above are the most recent examples of these clumsy attempts at a smear campaign. There’s even a hit-piece mailer (that couldn’t spell my name right) targeting Council Member Tony Kranz and me, funded by development interests, including the Building Industry Association (BIA), from Irvine, San Diego, Sacramento and other places outside Encinitas. And the spurious allegations about the state’s open meetings laws have again infiltrated this coming week’s City Council agenda — not coincidentally the last City Council meeting before the election. There’s a lot at stake in the upcoming Encinitas election for City Council and Mayor. The forces opposed to my election are mounting an effort to “retake” the city from the more environmentally oriented decision-making policies that my colleague Tony Kranz, Lisa Shaffer and I champion on the City Council. Before 2012, we had a City Council majority that was much more pro-growth and at times dismissive to our community’s concerns. We must not go back to those days. I’ve always believed in both an environmental commitment and fiscal responsibility. The fiduciary obligation to manage taxpayer money is one of my most cherished core values. I understand that by leading and actually doing things on behalf of Encinitas residents, I won’t be liked by everyone. And this last 16 days is when the clash is the most pronounced, although it can be nearly impossible for voters to sort out fact from fiction. 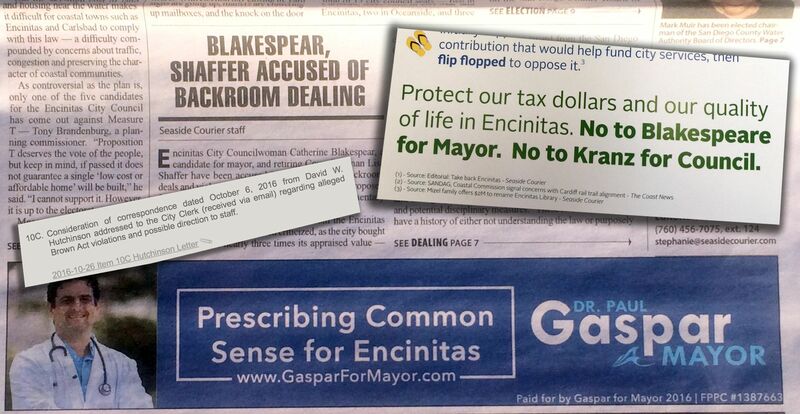 For a clear example of the differences between my opponent and me, please read these two candidate profiles in this week’s Encinitas Advocate: mine is here and Paul Gaspar’s is here. We were both asked the same questions and responded in writing to the Advocate reporter. I think you’ll agree that the difference in relevant experience, priorities and world view is pronounced. This is a tightly wound time, and each day is a new challenge. But we know what we’re getting into when we decide to run for office, and my skin has certainly grown thicker with each passing round. The pro-development group that funded the attack mailer has at least $100,000 in its war chest, based on the required disclosure documents. Less than $10,000 of it has been spent, so more attacks are probably coming. We’ll continue to focus on our vision for Encinitas and take the high road in this campaign. Your many messages of support tell us that our positive, grounded-in-facts, pragmatic and balanced approach is what Encinitas residents want in their Mayor. Please spread the word about our campaign to preserve our paradise in Encinitas. Your personal endorsement to friends and family means much more than anonymous, baseless attacks. P.S. This Monday, October 24, is the last day to register to vote online at registertovote.ca.gov. Previous Post10/21/16: Help us Preserve Our Paradise!Next Post10/30/16: What Makes a Successful Mayor?